What, with all the apple lovers out there we have no reviews? The apple reminds me of the one in Apple Mallow. If you liked that scent, you will find this a more complex, buttery take on that note. I am of the generation that remember the first wave of artificial apple notes (both green and red) that swept the world in the 1970's and found it's way into a plethora of shampoos both cheap and expensive. It is that unfortunate legacy that apple scents have for me and those of my age. Predating the "freshness" of aquatics by nearly a decade; apple represented "apple fresh". So I was curious to see what take Angela had for an apple based fragrance. The opening is a wonderful melange of rich sweet apple desserts notes that has a similar 'nose feel' to the opening of vintage Egoiste (Chanel) with rich, stewed fruit, Sandal Wood and vanillas. After a few seconds the 'fresh' apple note emerges and to be honest while that note dominates, I loose my interest. Fortunately that phase only lasts a few minutes before the feeling of CAF shifts towards a more adult crisp fermented cider characteristic. My interest has now again been piqued and I am very keen to see where this chameleon takes me. As the crispness of the cider recedes, the siillage drops as well and you are left with the apple Pie and Apple Danish suggestions. In the final stages the caramel and sweetened wood notes are left remaining on the skin with the hint of apples swirling around. I definitely consider this to be a cold weather scent and definitely suitable for both sexes. My own skin does not amp up sweetness, so do test if you have the sort of skin where sweet is magnified. If you are male and like sweeter winter scents like Egoiste or Il (Lancetti), I am sure you would like this as well. This scent is, and I don't use this word often to describe scents,...scrumptious. It is the appleiest apple scent to ever fall from the perfume tree, and I love it so. It's fresh and creamy and I get a fair amount of cream cheese tang too, which was interesting and not what I was expecting since it was way at the end of the description. But oh man. It is, here's that word again, scrumptious. My only complaint is that it fades really quickly on me, though the description clearly states it has lower sillage and is nice for work environments. It's an apple-centric scent, and as a top note, that's just the nature of the beast. The dry down is mostly vanilla with some mild apple cider spices. If you like apple- try this! An apple lover's dream scent! 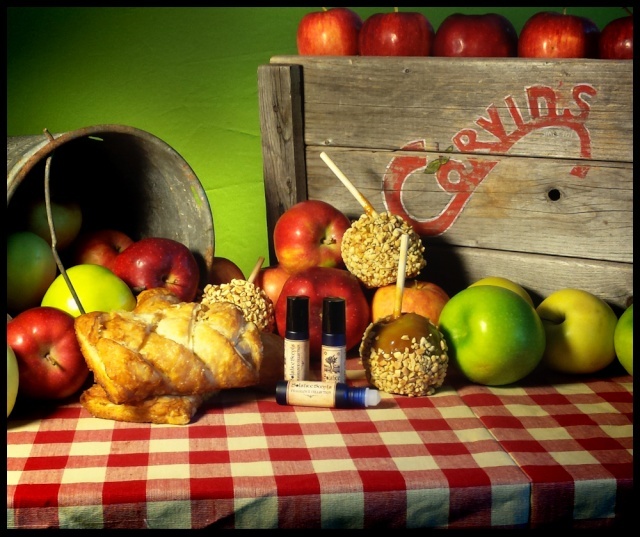 Corvin's Apple Fest gives you all the aspects of an apple fragrance in one perfume. It starts out smelling like fresh apples in a crate at the farmer's market, morphing into rich cider, then drying down to a lightly spiced caramel apple pie, crust and all. I only get a hint of tangy creaminess from the cream cheese danish. This, like so many other Solstice Scents perfumes, is so realistic and evocative. Another sample, I chose to pick up, Corvin's Apple Fest is seriously delicious. The first time to try it, I was amazed at how yummy the fragrance became from the initial application, to the dry down, and on into the next hour or more, I just could not get over the lovely blends of apple pastries, cider, pie and danish. What really ties all the apples together are the caramel, vanilla and cream cheese! With just a sample in hand, I must go see if a full bottle is in stock! This scent makes me want to eat my arm off. I'm not even sure I'd regret it, if it tasted as good as it smells! Delicious apple pastries open the scent, and though the apples fade bit by bit as time wears on, they never completely disappear. A hint of spice presents itself after a couple of minutes, but I think that's mostly my skin thinking that there SHOULD be spices, because apples, and then it realizes it's a bit of a spice whore and calms down. As the scent wears on the cream cheese comes out slightly, and it's just all pastries and cream cheese and apples and perfection. Warm and foody, this isn't one to miss! SS description is accurate here. Starts off as a bright, just bit into a sweet pink apple smell and dries down to creamy frosted pastry goodness. I got 7 samples and I think this was my favorite. Layering it with Riverside Hayride or Covered Bridge can balance out the sweetness if it's too much. I will be trying more gourmand scents from SS in the future. Great gooey baked goods scent that doesn't turn into a phoney plastic. This starts of as a bright green apple scent with a bit of spice. I have a thing for apple scents where you can even smell the skin, and this is one of those. Very realistic! As it dries the caramel and pastry notes come out with a hint of cream cheese. For me the dry down is mostly sweet pastry with caramel and vanilla. The apple is still there but changes to a mild cooked apple scent rather than fresh apple, like apple pie filling or baked apples. My one complaint is that I wish the apple was brighter in the dry down but this is a delicious and fun scent either way. Warm foody spicy apple. My favorite fall scent !!!! This sounded so perfect, but the spices do not play nicely on my skin. It starts off with a strong, sharp, cinnamon cider spice, along with a plasticy undertone. It makes me think of holiday spice candles. AFter an hour, the sour, sharp spiciness is more in the background, but it still doesn't smell right on me. I can pick out the caramel and something woody, like craft store baskets and wreaths. It's weirdly not really apple-y or foodie on my skin, sadly. It's sharp cider spice candles, wooden wreaths, caramel and a hint of apple juice. I don't get any pastry, vanilla or cake, and it's more spice and caramel than apple.